Yesterday when I woke up, I heard birds chirping. I know it’s a bit early for a sign of spring (and the crows never seem to stop cawing), but it was a nice sound to wake up to. Every year, I never realize that I miss birds chirping until I hear them again for the first time. 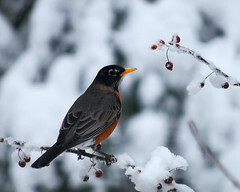 This entry was posted in observations and tagged birds, snow, song, spring, winter bird. Bookmark the permalink.